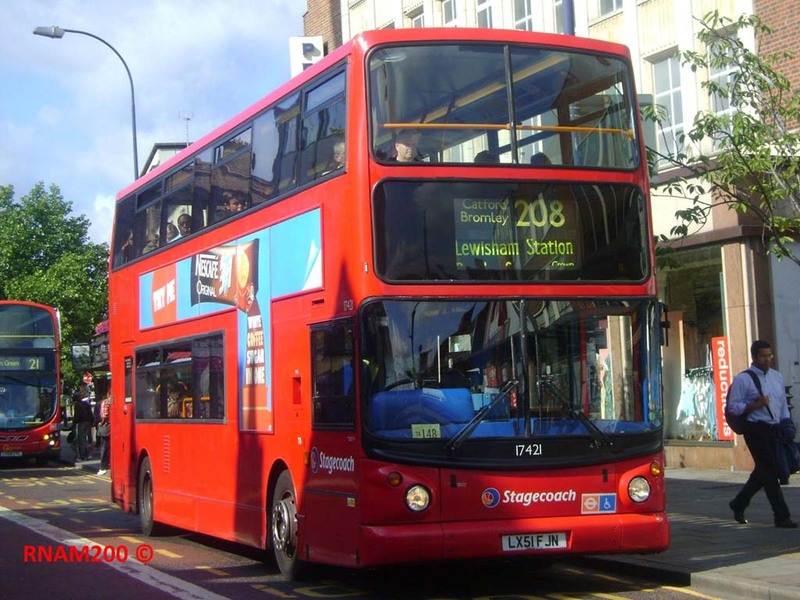 The 208 has the distinction of having been the last route in London to operate in overlapping sections, that is to say, with no through service from one end of the route to the other. During the day on Mondays to Saturdays, buses from Orpington ran as far as Catford whilst other buses started from Bromley Common to Lewisham. Both sections ran every 12 minutes giving a 6 minute service on the overlap, giving the route one of the largest peak vehicle requirements of any suburban route, at 22 buses – a 23rd bus was used on Saturdays. (During evenings and Sundays, buses ran from Orpington to Lewisham every 12 minutes.) Running the extra frequency by way of short workings between Bromley and Catford was tried, but was discontinued after about a year. This type of service structure has long since gone out of favour due to the potential confusion caused to passengers. In many cases the separate sections were simply given different route numbers (though thereby preventing a more economical through service operating at quieter times). In the case of the 208 however the solution was to provide a through service over the full route at the lower frequency, and extend a second route to cover the busiest section. The first proposal was for an extension of route 199 from Catford to Bromley North, but satisfactory standing arrangements were never found and so the scheme fell through. It was felt that for the 199 to continue to Bromley South or even Bromley Common would make the route too long. Instead, the solution eventually adopted was for route 320 to be extended from Bromley North to Catford, actually reducing pressure on the Bromley North stand. As the 320 was less frequent it was increased so there were no significant overall cost savings, but the end result is undoubtedly a better service all round – though the 320 suffered at first due to an under-resourced schedule. Even between Orpington and Bromley buses can get very busy, especially at school start and finish times, late evening pub-turn-out and Monday to Saturday daytime shopping hours, despite being one of the most frequent routes (every 12 minutes) to reach Orpington, through mainly residential areas. The Lewisham end can also get extremely busy – though there are enough buses overall, there is considerable cross-Catford traffic on the 208; Catford is something of a non-destination for the 320, especially as the lengthy turning arrangement is rather wasteful. From this point of view the original plan for the 199 would have been better, reducing over-bussing between Catford and Bellingham and boosting the through service. The 208 started in the 4 September 1982 scheme, replacing route 94 south of Bromley (the remainder becoming the 261) and complementing the 47 between Bromley and Lewisham. There was initially a Saturday extension to Surrey Quays, but that did not last. Initially Routemasters from Catford garage were used, but they were replaced by new Leyland Titans within a few years. Bromley garage also gained an allocation, the the route has been transferring back and forth between the two ever since. 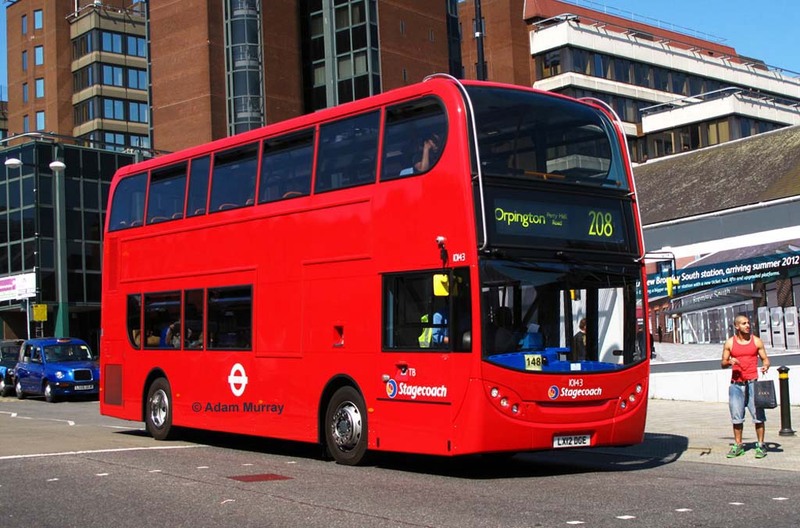 Usually both garages have been present, but Stagecoach’s extensive tender losses in the Bromley area in recent years have allowed Bromley garage to take full control. There have been periods of single deck operation. Leyland Nationals were used for a few years, and more recently LV class Dennis Lances were used between late 1994 and November 1997. In both cases single deckers were completely unsuitable, and mainly used on the quieter Orpington end. In terms of the service structure, there have been relatively few changes, though there was a big frequency increase in April 1991 after the 1 was withdrawn south of Surrey Quays – the 199, coincidentally, being the replacement for the middle section of the 1. The route has recently been re-stocked with Alexander Dennis E40D double deckers, and representing the class is 10143 (LX12 DGE) heading down the hill past Bromley South station on 26 July 2012. The pedestrian seems to be entering into the Olympic spirit! Previously the route was operated by Dennis Tridents, of which the E40D is an updated version. Some of these are still allocated to Bromley garage for other routes and can turn out on the 208 from time to time, so I have included this picture of 17421 (LX51 FJN) in Lewisham High Street on 9 June 2011 – though this particular bus has since been withdrawn from service. Like most Bromley Tridents, it is a long wheelbase model, and the 208 was allocated long wheelbase vehicles which were undoubtedly needed for loadings. The E40Ds, though, are short wheelbase – the manufacturer has managed to squeeze in a couple of extra seats by relocating equipment, but this is nonetheless a retrograde step from a passenger perspective. Photo © RNAM200 (Robert Mighton).